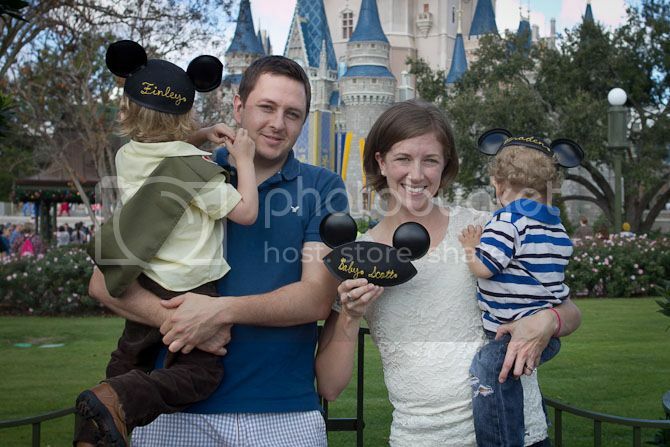 The Mickey hats are one of my favorite things about Disney--especially the curls sticking out the bottom of them. And the Russell/Mickey combo. 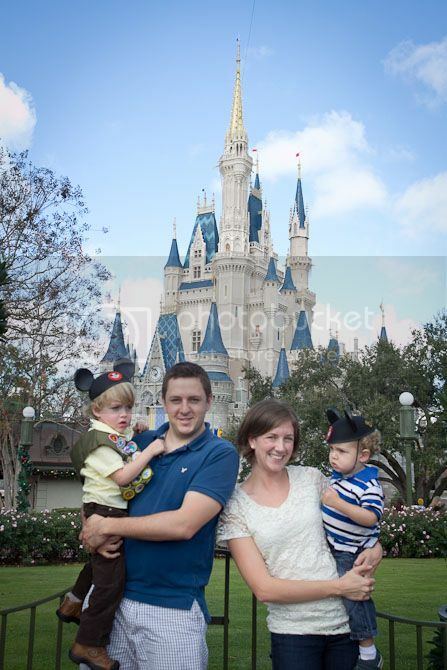 I was desperate to get a good picture with the castle, but the kind Disney photographers just couldn't manage to focus on us. There was an exciting show going on at the Castle, so the boys couldn't be bothered to face the camera. Which is a shame, because we were trying to show off our newest set of ears! 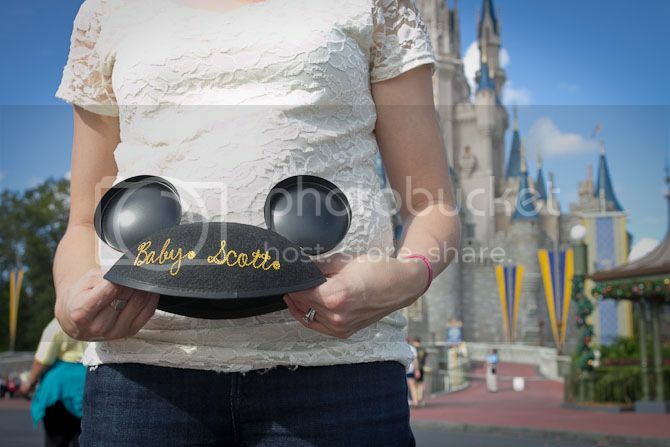 That's right, they'll be a third little guy (or gal... but let's be serious, probably a guy) joining us in July. Two of us are very excited, one of us is kind of confused and wants to name the new baby Braden, and one of us has no idea. So there you have it--an explanation why the blog has been a little lacking the last few months and a preview of things to come! I've finally embraced the fact that this baby is affecting the way my pants fit and am looking forward to the rebound in energy and appetite that the 2nd trimester brings. And of course, we're acutely aware of the blessing this little baby is and grateful that we get the chance to have another. I can't believe I surprised you twice! yeah! I was super surprised that I commented twice. Weird. Iphone error. Thanks Penny! I hope the baby is as cute as your pup. :) Wrigley is a cute baby name, right? I love the way you let your friends know about the new little one. Very exciting! Congratulations! 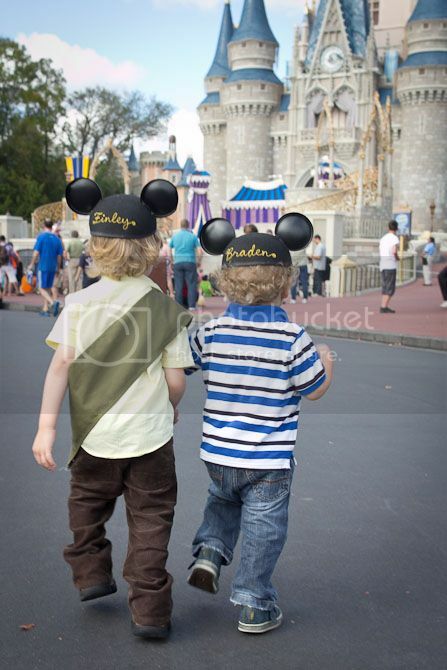 And I love the picture of the two boys looking at the castle . . . with the curls coming out underneath the Mickey ears. Precious! Caught the fever huh? Was it the romantic B&B stay at our residence? Congratulations! I'll relay it to Derrick (who will give Sol a hard time for not calling him before it hit mainstream media). Very happy for you! Sol always deserves a hard time. I warned Sol I was posting it and he fell asleep. Pregnancy is rough on a man. And you certainly inspired us to keep multiplying! Your pants may FEEL different, but you LOOK the same (and great). Congrats, dear friend! YEAH!! Congrats Rach and Sol!